At L.E. Phillips-Libertas Treatment Center, we never stop believing that comebacks are possible. We build hope that recovery from drugs, alcohol, and cognitive challenges is possible. We can provide you with the chance to live your life free from substance use disorders. 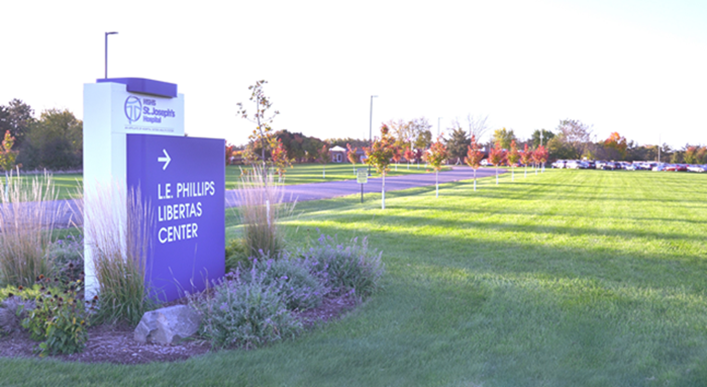 L. E. Phillips-Libertas Treatment Center can trace its origins back to the accomplishments of the Hospital Sisters of the Third Order of St. Francis, pioneers in the treatment of alcoholism since the 1940s. Opened in 1977, the Libertas Treatment Center's programs are services of Hospital Sisters Health System. This beneficial connection allows the supportive coordination of patient care and treatment of the physical, emotional, and special aspects of the disease. Today, L.E. Phillips-Libertas Treatment Center continues the legacy of touching lives with hope, encouragement, and wellness. We're accredited by the Joint Commission on the Accreditation of Healthcare Organizations and certified by the State of Wisconsin for substance use disorder treatment and outpatient mental health services. The Center also recently became a member of the Hazelden Betty Ford Patient Care Network. The network, formed in 2017, is the first of its kind in the addiction treatment industry. Members like L.E. Phillips-Libertas Treatment Center gain access to tools, resources and collaborative consultation for their organization's leadership, staff, patients, families and communities. Our multidisciplinary team offers the broadest continuum of treatment services for adults and adolescents in Eau Claire, Chippewa Falls, and surrounding communities. L.E. Phillips-Libertas Treatment Center is committed to the evolution of the latest clinical approaches in helping our clients while always holding the twelve steps of Alcoholics Anonymous as the foundation of our principles of substance use disorders. Orientation is focused on providing a recovery environment that is supportive and empowering and concentrates on what is good for our client rather than what is easy for our staff, client, and referral sources. By maintaining a supportive, nonjudgmental environment, we believe all people can recover from the devastating disease of addiction and mental illness. Call 715-723-5585 for more information.